People ask me all the time about our packing list. Before heading out on a nomadic lifestyle I think it's one of the things people have a hard time wrapping their heads around. How much of x do I take with me? Can I find y in Asia? What size towel do I really need? How on Earth will we cart this all around? The best suitcase ever! Even our 7 yo can easily wheel it on uneven terrain! These are all important things to consider and I remember when we were in the planning stages it really consumed me. So much so that when I finally settled on a list I decided to write a post about it. You can check it out here. Now, almost 3 years from when we left to be nomadic I laugh at that list and all the worry that went into it. But we all start someplace right?! Well the way we travel has changed and so has our packing style so I thought I would share it again. 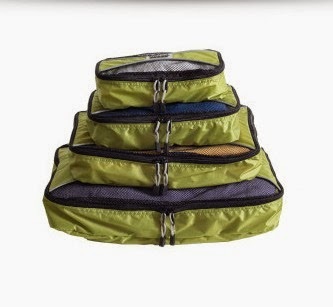 One thing I had been wanting forever and we finally added to our list is Pro packing cubes. I have been hearing about how great they are so got a hold of them before our most recent trip and they were amazing. Completely removes the need to unpack as everything is neat and organized and everyone can have their own color. I wont travel again with out them. L.L. bean large multi day pack, this thing has seen better days as my husband has owned it for over 15 years but it's still holding strong so we still use it. Its our largest pack and carries my husbands clothes, first aid kit, toiletry overflow from my pack and any misc item with no other home. Great review of best hiking backpacks can be found here. Osprey Porter 46 that started as the pack for my oldest but as he has grown I took his smaller pack. It holds all mine and my youngest clothing, our toiletries and whatever else we can fit in. Dueter Fox 30 which my 11 year old carries. He could carry a bigger pack and I would say even a 7 or 8 year old could manage this pack. Its durable, light, and holds everything quite well. We now use it for our lesser used items, like cold weather clothing, and only open it when we need it. We have added 2 wheeled suit cases/duffel bags, 1 cheaper model my oldest uses and 1 great new pack from Pacsafe. The difference in those suitcases is amazing. All suitcase are NOT created equally that is for sure. The Pacsafe bag is sturdy and takes a beating, with 3 rough boys I can definitely attest to that! It has an exomesh which makes it impossible to slash through and puncture resistant zippers, I challenge anyone to break into this thing! We plan to switch over to suitcases as we need to replace any of the bigger packs and if I have my way, as I usually do, every single one will be a Pacsafe bag! Even my 7 year old can wheel it around, it's amazing! 4 day packs with electronics compartments that holds our computers and other electronics we do not want leaving our side. Each of the parents and 2 oldest boys have their own. 1 small day pack for my 7 year old that he carries and that hold a small assortment of his toys. He has Lego's, action figure type guys, and animals. After staying put for a while here in Hawaii he has accumulated quite a few toys, not sure if we will add a new or larger pack or just get rid of most of it. We are all real minimalists especially when it comes to clothing. Even still it is the largest cumulative item to fill our packs. Underwear for all. I have the most while the boys only have a couple pairs each. Hand washing under garments is super easy so no need to have loads. Shorts...we each have 3-4 pairs. Little guy has a few more due to his excessive outfit changes. Pants and long sleeved shirts. We each carry a couple of each as we are not in cold weather very often. Our tolerance to even a hint of cold though necessitates something! Some comfy jammies for mom, no one else seems to differentiate between clothes and bed clothes so we don't bother with pajamas. A couple of windbreaker type jackets, not all of us have these. Couple pairs of socks each. Shoes...my 2 youngest sons just have Crocs, my husband has flip flops and some walking shoes, my oldest son and I have flip flops as well as running shoes since we have taken up running in the past year. I also have a pair of sandals that are open air. I use these for walking in warm weather, they may or may not make the cut on our next move. Depending on if youre running or hiking you may want to check out these good tips and reviews. In this section we definitely increased items over the past 2 years. The boys have gotten older, there is more school work involved, and we realized if everyone had their own items life was much more conflict free. 1 point and shoot camera that will not be replaced once it breaks. Seriously, can you believe the photos phones take these days?? Power strip, no not necessary but extremely helpful. We have had multiple rooms with a single plug available, can you imagine how that goes with all those electronics to charge?! We have let go of the specification on the products we use. It just became too much of a challenge so we use whatever is around and inexpensive. Usually we just buy these things when we get to where we are going. Carting around shampoo and that type of thing just overload our bags. 2 sets of snorkel gear. Again with slow travel it is just worth it to me. When you find a mask that works for you it is important to hang onto it for dear life. Peeler, garlic press, and mini whisk....Laugh if you want but we use these kitchen tools all the time and they are the few items I am very picky about. Not just any peeler will do...no sir! It really does seem like a lot and I admit we have added some things to our load as we travel more slowly now and are eying a more permanent base. When you don't have to lug things around every couple days it makes sense to carry the things that just make life more comfortable. So my advice is to pack according to how fast you are moving, super light for quick travel and comfort for slower travel! I have made the same experience. Before I started travelling I always, as in always, completely overpacked. Especially with clothes. And as it turns out, I end up wearing the same pair of comfy shorts and t-shirts every day. And with shoes: You can really never go wrong with slippers. Yes the garlic press seems like a stretch I guess but I hate mincing it myself and we use it often!